Marián Hossa (Slovak pronunciation: [ˈmaɾijaːn ˈɦɔsa] ; born 12 January 1979) is a Slovak former professional ice hockey right winger under contract for the Arizona Coyotes of the National Hockey League (NHL). Hossa was drafted by the Ottawa Senators in the first round, 12th overall, of the 1997 NHL Entry Draft. After spending his first seven NHL seasons with the Senators, he played for the Atlanta Thrashers, Pittsburgh Penguins, Detroit Red Wings, and Chicago Blackhawks. Over the course of his career, he made five NHL All-Star Game appearances and played in three consecutive Stanley Cup Finals with three different teams, finally winning the Stanley Cup in 2009–10 with Chicago. He won two additional Stanley Cup championships with Chicago during the 2012–13 and 2014–15 seasons. Hossa accumulated 525 goals and 609 assists for 1,134 points in 1,309 regular-season games over his 19-year NHL career. He was the 44th player in NHL history to score 500 goals, and the 80th player to score 1,000 points. The Ottawa Senators are a professional ice hockey team based in Ottawa, Ontario. They are members of the Atlantic Division of the Eastern Conference of the National Hockey League (NHL). The Senators play their home games at the 17,373-seat Canadian Tire Centre, which opened in 1996 as the Palladium. Prior to the 2017–18 season, the Blackhawks announced that Hossa was suffering from a progressive skin disorder and would miss the entire 2017–18 season. He announced he would no longer play professional hockey in May 2018 and intends to retire after his contract expires in 2021. Hossa's contract was traded to the Arizona Coyotes in July 2018 as part of a seven-player deal. The 2017–18 NHL season was the 101st season of operation of the National Hockey League. With the addition of a new expansion team, the Vegas Golden Knights, 31 teams competed in an 82-game regular season. The regular season began on October 4, 2017, and ended on April 8, 2018. The 2018 Stanley Cup playoffs began on April 11, 2018, and concluded on June 7, with the Washington Capitals winning their first Stanley Cup in the Finals over the Vegas Golden Knights in five games. Hokejový Klub Dukla Trenčín is a professional Slovak ice hockey club based in Trenčín, playing in the Slovak Extraliga. The club has won three Slovak league championships and one Czechoslovak league championship (1992). The team is nicknamed Vojaci, meaning "Soldiers" in English. The Canadian Hockey League is an umbrella organization that represents the three Canada-based major junior ice hockey leagues for players 16 to 20 years of age. The CHL was founded in 1975 as the Canadian Major Junior Hockey League, and is composed of its three member leagues, the Western Hockey League, Ontario Hockey League, and Quebec Major Junior Hockey League. For the 2017–18 season, its three leagues and 60 teams represent nine Canadian provinces as well as four American states. The CHL Import Draft is an annual event in which every team in the Canadian Hockey League may select the rights to eligible import players. An import is classified as a player who does not have residency status in either Canada or the United States. The draft is conducted online, during the last week of June, or first week of July, following the NHL Entry Draft. Teams from the Western Hockey League, Ontario Hockey League, and Quebec Major Junior Hockey League, systematically take turns making selections in reverse order of the team's standings in the CHL from the previous season. Teams can have a maximum of two imports which may only be obtained through the draft, and teams must have an open roster space for an import player before a draft selection is made, otherwise they must pass on the opportunity. The draft is open to all position players, but the Canadian Hockey League banned the drafting of European goalkeepers from 2014 to 2017. Since the first Import Draft in 1992, over 1,700 players have been selected, with many later going onto the National Hockey League. The majority of imported players come from the Czech Republic, Russia, and Slovakia. After seven games in the NHL, the Senators assigned Hossa to junior, where he tallied 45 goals and 40 assists for 85 points in 53 games with the Winterhawks in 1997–98, earning him the Jim Piggott Memorial Trophy as WHL rookie of the year, as well as CHL and WHL West First Team All-Star honors. He led the Winterhawks to a President's Cup as WHL champions en route to the 1998 Memorial Cup championship. Late in the third period of a tied championship game against the Ontario Hockey League (OHL)'s Guelph Storm, Hossa collided with Guelph forward Ryan Davis and suffered a serious knee injury, forcing him out of the game. The Winterhawks went on to clinch the championship in overtime and Hossa returned to the ice on a chair as his teammates pushed him around with the Memorial Cup to celebrate the victory. With seven points in four tournament games, Hossa was named to the Memorial Cup All-Star team, along with teammate Andrej Podkonický. The 1997–98 WHL season was the 32nd season for the Western Hockey League (WHL). Eighteen teams completed a 72-game season. The Portland Winter Hawks won the President's Cup before going on to win the 1998 Memorial Cup. The Jim Piggott Memorial Trophy is awarded annually to the top rookie in the Western Hockey League. The Ed Chynoweth Cup is an ice hockey club championship trophy awarded to the playoff champion of the Western Hockey League (WHL). Originally called the President's Cup when the league was founded in 1966, the trophy was renamed in 2007 to honour Ed Chynoweth's long service to junior hockey in Canada. The WHL champion earns a berth into the Memorial Cup tournament, Canada's major junior championship. The Kamloops Blazers have won the most championships with six, followed by the Medicine Hat Tigers with five. The Spokane Chiefs were the first team to win the renamed trophy in the 2007–08 WHL season. The current (2017–18) holders of the Ed Chynoweth Cup are the Swift Current Broncos. Hossa recorded 32 goals and 75 points in 2000–01, finishing second in team scoring behind Alexei Yashin  and earning his first NHL All-Star Game appearance in Denver. In the subsequent off-season, his rookie contract expired and Hossa became a restricted free agent. Unable to come to terms before training camp for the 2001–02 season, Hossa sat out the first two weeks before signing a three-year, $8.5 million contract on 26 September 2001. Despite Hossa's lucrative new contract, his production would dip to 66 points in the first year of the deal. Hossa would regain form in 2002–03 with a career-high 45 goals and a team-leading 80 points,  while competing in the 2003 NHL All-Star Game in Sunrise, Florida. He then led the Senators to a long playoff run where they were ultimately eliminated in seven games by the eventual Stanley Cup-champion New Jersey Devils in the Eastern Conference Finals. Hossa led the Senators with 16 points in 18 post-season games. The following season, he led the Senators in scoring for the second consecutive season with a personal best 82 points, then added four points in seven games in the playoffs as the Senators were eliminated by the Maple Leafs in the first round. Due to the 2004–05 NHL lockout, Hossa spent the 2004–05 season playing in Europe. Beginning the season in Slovakia, he joined Mora IK of the Swedish Elitserien to play with his younger brother Marcel after 19 games with former club Dukla Trenčín. After 32 points in 24 games with Mora IK, Hossa returned to Dukla Trenčín, where he completed the season for a total of 42 points in 22 games with the team. With NHL play set to resume the following season in 2005–06 and Hossa's previous contract expired, he signed a three-year, $18-million deal with the Senators. However, the contract only precipitated a deal that sent him that same day to the Atlanta Thrashers along with defenseman Greg de Vries for all star forward Dany Heatley, who had requested a trade following the death of teammate Dan Snyder in a car crash for which Heatley was ruled responsible. Hossa joined star winger Ilya Kovalchuk and scored 39 goals and 53 assists for 92 points, surpassing his previous personal best by ten points, in his first season with the Thrashers. In the 2006–07 season, Hossa made franchise history as the first Thrasher to score 100 points in one season, finishing with 43 goals and 57 assists; along with a plus/minus rating of +18. He was named to his third All-Star Game in Dallas where he notched four assists. In the final game of the regular season, Hossa recorded two assists against the Tampa Bay Lightning to achieve the 100-point mark,  which still stands as the franchise's single-season points record. The season also marked the first division title and post-season appearance for the Thrashers, clinching the Southeast Division title for the third playoff seed. Hossa, however, only managed one point in four games as the Thrashers were eliminated in the first round by the New York Rangers. In the last year of his contract with the Thrashers in 2007–08, the team and Hossa could not agree on an extension, Hossa was acquired by the Pittsburgh Penguins at the trade deadline on 26 February 2008, along with Pascal Dupuis, in exchange for Colby Armstrong, Erik Christensen, prospect Angelo Esposito and the Penguins' first-round pick in 2008 (Daultan Leveille). In his Penguins debut two days later, Hossa injured his medial collateral ligament (MCL) in a knee-on-knee collision with Glen Murray of the Boston Bruins. Hossa missed the next six contests before rejoining the team for the conclusion of the regular season, playing on a line with Dupuis and Sidney Crosby. Hossa completed the regular season with 66 points in 72 games split between the Thrashers and Penguins. He had also appeared in his fourth All-Star Game while still with the Thrashers as the host-city. Despite a reported five-year contract offer worth $7 million annually from the Penguins in attempts to retain his services, on 1 July 2008, Hossa signed a one-year deal with the Detroit Red Wings worth $7.45 million. Hossa had also reportedly turned down a multi-year offer from the Edmonton Oilers worth at least $9 million per season. Hossa explained that he opted for the shorter-term contract in hopes of a better opportunity to win a Stanley Cup with the Red Wings. With Red Wings' veteran forward Kirk Maltby already wearing Hossa's number 18, Hossa switched to 81 with Detroit. Hossa notched his first goal as a Red Wing on 18 October, an overtime winner against the New York Rangers, which also marked the 300th goal of his career. Hossa scored a goal in his return to Pittsburgh with the Red Wings on 8 February, where he was heavily booed by the Pittsburgh fans. After missing two games due to a neck injury late in the season, Hossa was taken off the ice in a stretcher after falling head first into the boards following a check from St. Louis Blues defenceman Roman Polák on 3 March 2009. Escaping serious injury after having laid motionless on the ice for several minutes, it was revealed that in addition to minor neck complications, Hossa also suffered a bruised knee and was listed as day-to-day. Despite the injury, Hossa returned to finish the season with a team-leading 40 goals for his third career 40-goal season. On 1 July 2009, Hossa signed a 12-year contract with the Chicago Blackhawks worth $62.8 million. The contract was front-loaded with $59.3 million due in the first eight years for an average cap hit of $5.2 million per season. It was also the most lucrative deal in team history until defenceman Duncan Keith signed a 13-year, $72 million contract several months later in December 2009. The signing of Hossa by the Blackhawks coincided with the departure of the team's leading scorer and MVP from the previous season, Martin Havlát, to the Minnesota Wild that same day. Shortly after signing Hossa, the team disclosed that the veteran forward was still rehabilitating a shoulder injury he sustained during the previous post-season. The injury required Hossa to undergo surgery, and caused him to miss the first eight weeks of the season. Hossa's contract negotiations became the subject of controversy in early August. On 31 July, the Ottawa Sun originally reported that the NHL launched an investigation on Hossa's long-term deal. Because the contract is front-loaded and expires by the time Hossa is 42, it was speculated whether retirement before expiry of the contract was part of the Blackhawks' negotiations. Such an agreement would be considered by the NHL to be a circumvention of the salary cap and the NHL Collective Bargaining Agreement (CBA), which would be subject to fines or the loss of draft picks. Even though the NHL did not fine or punish the Blackhawks, they later introduced a new rule preventing teams from front-loading contracts as lucratively as the Blackhawks did with Hossa. During the Blackhawks' first playoff series in 2010, Hossa received a five-minute major penalty for boarding Nashville Predators defenceman Dan Hamhuis. With 13.6 seconds left in regulation, Hossa's teammate Patrick Kane tied the game. In the ensuing overtime, Hossa scored the game-winning goal shortly after exiting the penalty box. Since Hamhuis was not injured, the NHL did not fine or suspend Hossa. On 23 May 2010, the Chicago Blackhawks swept the San Jose Sharks to earn a trip to the 2010 Stanley Cup Finals, sending Hossa to the Final for the third-straight year with his third different team, a first in the NHL. Fans and the media had dubbed Hossa's inability to win the Stanley Cup while going to the finals the "Hossa Curse" or the "Hossa Hex." According to Hossa's agent, Ritch Winter, Hossa's third consecutive year in the Stanley Cup Finals was no coincidence, with Winter stating that they had used a mathematical model to determine the teams most likely to get at least 100 points in the 2009–10 regular season. On 9 June 2010, Hossa finally lifted his first Stanley Cup. Chicago captain Jonathan Toews handed the Cup to Hossa first during the team pass-around. Early in his career, Hossa represented Slovakia in two World Junior Championships, in 1997 and 1998. Also appearing in his first World Championships in 1997, tallying two points as an 18-year-old, Hossa has made seven appearances in the tournament throughout his career. Despite personal World Championship best seven-point performances in 1999, 2004, 2005 and 2006, Hossa has remained medal-less with the Slovak men's team. Hossa made his Olympics debut at the 2002 Games in Salt Lake City, tallying six points in only two games for Slovakia. In the subsequent 2006 Winter Olympics in Turin, Hossa accumulated ten points in six games, but Slovakia was kept from the podium. During the 2010 Winter Olympics, Hossa scored the game-tying goal in the third period against Russia during the preliminary round. Hossa also competed for Slovakia at the 2004 World Cup of Hockey, held prior to the NHL lockout, but managed just one goal in four games. 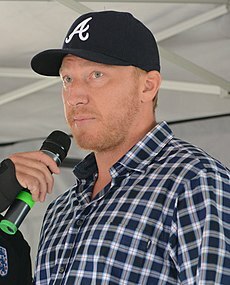 Hossa was born in Stará Ľubovňa, Czechoslovakia, to František Hossa, a professional hockey player, and Mária Hossová, a clothing designer. His younger brother by two years, Marcel Hossa, drafted by the Montreal Canadiens in 2000, followed in his footsteps playing for both of Marián's previous junior teams, Dukla Trenčín and the Portland Winter Hawks, while the two have played together for Mora IK of the Elitserien during the 2004–05 NHL lockout and on the Slovak national team in the World Championships and Winter Olympics. Coincidentally, they were both dealt by their NHL teams on the day of the 2007–08 trade deadline — Marián from Atlanta to Pittsburgh and Marcel from the New York Rangers to the Phoenix Coyotes. The younger Hossa is currently playing overseas with HC Plzeň of the Czech Extraliga. Hossa also grew up with Marián Gáborík and Zdeno Chára in Trenčín, and remained close friends with them through his NHL career. Trenčín honored the trio by naming three streets after each skater in 2015. Marián's father was head coach of the Slovak national team and coached his sons in several tournaments. Ty Curtis Conklin is an American former professional ice hockey goaltender. Throughout his National Hockey League (NHL) career, he played for the Edmonton Oilers, Columbus Blue Jackets, Buffalo Sabres, Pittsburgh Penguins, St. Louis Blues and two stints with the Detroit Red Wings. Marcel Hossa is a Slovak professional ice hockey left winger currently playing for HK Dukla Trenčín in the Slovak Extraliga. Hossa previously played in the National Hockey League (NHL) with the Montreal Canadiens, New York Rangers and Phoenix Coyotes, having been drafted by the Canadiens in the first round, 16th overall, in the 2000 NHL Entry Draft. Daniel Michael Cleary is a Canadian former professional ice hockey player who played in the National Hockey League (NHL) for the Chicago Blackhawks, Edmonton Oilers, Phoenix Coyotes and Detroit Red Wings. While playing for Detroit, on June 4, 2008, Cleary became the first player from Newfoundland and Labrador to win the Stanley Cup. Cleary was drafted 13th overall by the Chicago Blackhawks in the 1997 NHL Entry Draft. Jason Williams is a Canadian professional ice hockey winger. He is currently plays for the Brantford Blast of the Allan Cup Hockey League and the London 3's on the 3HL TOUR 3 on 3 Professional Hockey League. Christopher Kunitz is a Canadian professional ice hockey left winger for the Chicago Blackhawks of the National Hockey League (NHL). Colby Joseph Armstrong is a Canadian former professional ice hockey player who played in the National Hockey League (NHL) for the Pittsburgh Penguins, Atlanta Thrashers, Toronto Maple Leafs and Montreal Canadiens in a 9-year career. He currently serves as an NHL analyst for Sportsnet. Armstrong's younger brother, Riley Armstrong, also played in the NHL, with the San Jose Sharks. Troy Norman Murray is a Canadian former professional ice hockey centre who played in the NHL. He is currently the color analyst on WGN-AM broadcasts of Chicago Blackhawks hockey games. Murray was born in Calgary, Alberta, but grew up in St. Albert, Alberta. Rejean "Ray" Shero is the general manager of the New Jersey Devils National Hockey League franchise. He was hired on May 4, 2015, replacing Lou Lamoriello. He was previously the general manager for the Pittsburgh Penguins franchise. He is the son of former Philadelphia Flyers and New York Rangers coach Fred Shero. Tomáš Kopecký is a Slovak professional ice hockey right winger. He is currently playing for HC Slovan Bratislava of the Kontinental Hockey League (KHL). He has previously played in the NHL with the Detroit Red Wings, Chicago Blackhawks and Florida Panthers. He won the Stanley Cup with both the Red Wings and Blackhawks. The 1999–2000 Ottawa Senators season was the eighth season of the Ottawa Senators of the National Hockey League (NHL). This season saw the Senators drop in the standings, as they finished with 95 points, down from the 103 they registered the previous season. They finished second in the Northeast Division and sixth in the Eastern Conference. They qualified for the Stanley Cup playoffs for the fourth straight season. The 2005–06 Ottawa Senators season was the 14th season of the Ottawa Senators of the National Hockey League (NHL). After one of their franchise-best regular seasons, finishing with 113 points, the Senators made it to the Eastern Conference Semi-final, in which the Buffalo Sabres eliminated Ottawa in five games. The 2007–08 Pittsburgh Penguins season was the franchise's 41st season in the National Hockey League (NHL). Their regular season began on October 5, 2007, against the Carolina Hurricanes and concluded on April 6, 2008, against the rival Philadelphia Flyers. The Penguins looked to improve upon their progress in the 2006–07 season after being eliminated in the first round of the Eastern Conference playoffs by the Ottawa Senators. During the season, the Penguins wore gold patches with "250" on them, honoring the city of Pittsburgh's 250th anniversary in 2008. The 2008 Stanley Cup Finals was the championship series of the National Hockey League's (NHL) 2007–08 season, and the culmination of the 2008 Stanley Cup playoffs. It was contested between the Western Conference champion Detroit Red Wings and the Eastern Conference champion Pittsburgh Penguins. This was Detroit's 23rd appearance in the Final, and its first since winning the Cup in 2002. This was Pittsburgh's third appearance in the Final, and its first since winning consecutive Cup championships in 1991 and 1992. The Red Wings defeated the Penguins four games to two, and were awarded the Stanley Cup. Detroit's Henrik Zetterberg was awarded the Conn Smythe Trophy as the Most Valuable Player of the playoffs. The 2009 Stanley Cup playoffs of the National Hockey League began on April 15, 2009, after the 2008–09 regular season. The sixteen teams that qualified, eight from each conference, play a best-of-seven series for the conference quarterfinals, semifinals, and championships, and then the conference champions will play a best-of-seven series for the Stanley Cup. The Columbus Blue Jackets made their first appearance in the playoffs in their nine-year history. Previously they had been the only franchise to have not made the playoffs. Also, home teams set a record by going 13-2 in the openers of all the series combined. There were no playoff games played in the Province of Ontario as this was the first time that the modern Ottawa Senators and the Toronto Maple Leafs both missed the playoffs in the same year. This was the most recent time that the Carolina Hurricanes were in the playoffs until 2019. The Blackhawks–Red Wings rivalry is a historic rivalry in the National Hockey League (NHL) between the Chicago Blackhawks and Detroit Red Wings. Prior to the 2013–14 league-wide divisional realignment, it was the most intense rivalry in the Central Division during the post-lockout era. They represent the two largest metro areas in the Midwest and are only separated by a 280-mile stretch of road, mostly covered by I-94. The clubs began playing each other in 1926–27, during the inaugural season for both franchises. The 2012 Stanley Cup playoffs of the National Hockey League (NHL) began on April 11, 2012, after the conclusion of the 2011–12 NHL regular season. These playoffs marked only the second time since the 1996 playoffs in which no Canadian teams advanced past the first round. These playoffs featured the return of the Florida Panthers to the postseason for the first time since the 2000 Stanley Cup playoffs, one of the longest playoff droughts in league history. Tomáš Jurčo is a Slovak professional ice hockey right winger who is currently playing with Charlotte Checkers in the American Hockey League (AHL). He began playing hockey in the HC Košice before moving to North America in 2009 to play for the Saint John Sea Dogs of the Quebec Major Junior Hockey League (QMJHL). He spent three seasons with Saint John, helping them win the Memorial Cup as major junior champions of Canada in 2011. Jurčo was drafted in the second round, 35th overall, by the Detroit Red Wings in the 2011 NHL Entry Draft. The 2013 Stanley Cup playoffs of the National Hockey League (NHL) began on April 30, 2013, following the conclusion of the 2012–13 NHL regular season. The regular season was shortened to 48 games, and the playoffs pushed to a later date, due to a lockout. The playoffs ended on June 24, 2013, with the Chicago Blackhawks defeating the Boston Bruins in six games to win the Stanley Cup. Patrick Kane won the Conn Smythe trophy as the playoffs MVP, with 19 points. 1 2 "1997–98". Portland Winterhawks . Retrieved 5 March 2009. ↑ "NHLPA PLAYER BIO: Marian Hossa". Archived from the original on 15 November 2006. Retrieved 13 September 2006. ↑ "NHLPA PLAYER BIO: Marian Hossa". Archived from the original on 22 March 2006. Retrieved 13 September 2006. 1 2 "Playing with a heavy heart". Sports Illustrated. 24 April 2000. Archived from the original on 7 September 2008. Retrieved 5 March 2009. ↑ "2000–01 Ottawa Senators [NHL]". Hockeydb. Retrieved 5 March 2009. ↑ "Hossa, Senators reach deal". Canadian Broadcasting Corporation. 26 September 2001. Retrieved 5 March 2009. ↑ "2002–03 Ottawa Senators [NHL]". Hockeydb. Retrieved 5 March 2009. ↑ "Hossa jumps to Swedish league". Canadian Broadcasting Corporation. 11 November 2004. Retrieved 5 March 2009. ↑ Diamos, Jason (24 August 2005). "Thrashers Trade Heatley to Senators for Hossa". The New York Times. Retrieved 5 March 2009. ↑ Odum, Charles (7 April 2007). "Playoff-Bound Thrashers Win Finale". The Washington Post. Retrieved 5 March 2009. ↑ "Penguins get Hossa, hoping he's the missing piece". ESPN. 27 February 2008. Retrieved 5 March 2009. ↑ "Hossa injured knee in Penguins debut". International Herald Tribune. 29 February 2008. Retrieved 5 March 2009. 1 2 "Hossa's OT goal gives Penguins 3–2 win, ends Rangers season". USA Today. 4 May 2008. Retrieved 5 March 2009. 1 2 "Hossa's playoff performance silencing critics". National Hockey League. 3 June 2008. Retrieved 5 March 2009. ↑ Molinari, Dave (5 June 2008). "Penguins' late rally falls short". Pittsburgh Post-Gazette . Retrieved 5 March 2009. ↑ "Hossa signs one-year deal with Stanley Cup champs". ESPN. ↑ "The official word on Hossa: no presser, and he's wearing #81". ↑ "Hossa's OT goal gives Wings 5–4 win over Rangers". USA Today. 18 October 2008. Retrieved 5 March 2009. ↑ "Hossa says he'll take less money to stay in Detroit". Detroit Free Press . 23 March 2009. Archived from the original on 2009-03-26. Retrieved 12 May 2009. 1 2 "Marian Hossa's quiet post-season play could play well into former team's hands". ESPN. 6 June 2009. Retrieved 22 July 2009. ↑ Kovacevic, Dejan (25 May 2009). "For Hossa, final vs. Penguins would be 'interesting'". Pittsburgh Post-Gazette . Retrieved 21 July 2009. ↑ St. James, Helene (13 June 2009). "Marian Hossa laments being Cup runner-up again". Detroit Free Press. Archived from the original on 16 June 2009. Retrieved 13 June 2009. ↑ McGran, Kevin (13 June 2009). "Marian Hossa has no regrets for leaving Penguins". Toronto Star. Retrieved 22 July 2009. ↑ Wyshynski, Greg (1 July 2009). "Good/Bad/Ugly: The top 10 free-agent wingers". Yahoo! Sports . Retrieved 23 July 2009. ↑ TSN.ca, staff (1 July 2009). "BLACKHAWKS SIGN HOSSA TO MULTI-YEAR CONTRACT". TSN . Archived from the original on 21 August 2009. Retrieved 3 August 2009. ↑ "Hawks announce Kane, Toews and Keith extensions". The Sports Network. 3 December 2009. Retrieved 3 December 2009. ↑ "Blackhawks' Hossa battling shoulder injury". TSN. 22 July 2009. Archived from the original on 25 July 2009. Retrieved 22 July 2009. ↑ Kuc, Chris (23 July 2009). "New Chicago Blackhawks winger Marian Hossa has shoulder injury". Chicago Tribune. Retrieved 3 August 2009. ↑ "Sources: NHL invesetigates Marion Hossa, Chris Pronger contracts". ESPN. 1 August 2009. Retrieved 16 October 2009. ↑ "Hossa scores twice in Blackhawks debut". Yahoo! Sports . Associated Press. 26 November 2009. Retrieved 26 November 2009. ↑ "Hossa hopes third trip to final leads to Stanley Cup glory" . Retrieved 27 May 2010. ↑ Custance, Craig (25 May 2010). "Marian Hossa's third consecutive Stanley Cup finals is no accident". Sporting News . Retrieved 28 October 2013. ↑ ADAM L. JAHNS. "Hossa aiming to end talk he's a Cup 'curse'". Archived from the original on 29 May 2010. Retrieved 26 May 2010. ↑ "Hossa's 900th Point Video". National Hockey League. Archived from the original on 13 January 2014. Retrieved 21 March 2012. ↑ Kuc, Chris (2014-03-02). "1,000th game an honor for Hossa". Chicago Tribune . Retrieved 2014-04-13. ↑ Isaacson, Melissa (2013-06-13). "Keeping old habits". ESPN . Retrieved 2014-04-13. ↑ "Chicago Blackhawks at Ottawa Senators - 10/30/2014". National Hockey League . Retrieved 30 October 2014. ↑ Arnold, Jeff (2016-12-12). "Blackhawks' Marian Hossa, an Elder Statesman, Adapts to Run With a Younger Crowd". The New York Times . Retrieved 2017-04-28. ↑ O'Brien, James (18 October 2016). "Marian Hossa becomes 44th player to hit 500 goals". NBCSports.com. Retrieved 19 October 2016. ↑ NHL, .com (18 October 2016). "Marian Hossa scores 500th NHL goal". NBCSports.com. Retrieved 19 October 2016. ↑ Hine, Chris (2017-04-01). "Blackhawks' Marian Hossa: 'Nice to prove to myself I still got it'". Chicago Tribune . Retrieved 2017-04-28. ↑ "Medical update on Marian Hossa". National Hockey League. June 21, 2017. Retrieved June 21, 2017. ↑ "Marian Hossa reveals skin disorder, to miss season". ESPN. 2017-06-21. Archived from the original on 2017-06-21. Retrieved 2017-06-21. ↑ "Blackhawks place Hossa on long term injured reserve". National Hockey League. 4 October 2017. Archived from the original on 4 October 2017. Retrieved 4 October 2017. ↑ Roumeliotis, Charlie (2018-05-19). "Blackhawks winger Marian Hossa: 'I will not play hockey anymore'". NBC Sports. Retrieved 2018-05-19. ↑ "Marian Hossa's contract to Coyotes in multiplayer deal". ESPN. 2018-07-12. Retrieved 2018-07-12. ↑ "Hossa deal highlight of trade deadline". Canadian Broadcasting Corporation. 26 February 2008. Retrieved 5 March 2009. ↑ Burnside, Scott (2013-06-11). "Chara and Hossa share Slovak connection". ESPN . Retrieved 2015-06-22. ↑ Kasperkevic, Jana (2015-06-18). "Proud Slovak city considers renaming street to honor Stanley Cup heroes". The Guardian . Retrieved 2015-06-29. ↑ "Hossa Adds Another Ring". 23 July 2010. Archived from the original on 26 March 2012. Retrieved 24 June 2011. ↑ Lazerus, Mark (2013-11-13). "Blackhawks' Marian Hossa back to feeling fine". Chicago Sun-Times . Retrieved 2013-12-02. Wikimedia Commons has media related to Marian Hossa .